This weekend I actually saw a double header of movies. Spending time with the family always equals going to the movies, and if we can't decide on one then we go to two! This time it was HOP on one day and YOUR HIGHNESS the next. I'll give you a quick run down of what I thought of each. 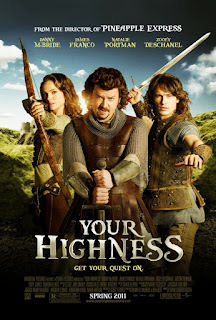 Okay I'll admit, I might have had higher hopes for YOUR HIGHNESS than I should have. It was one of those movies that you go into wanting to like so badly, that it really doesn't stand a chance of living up to expectations. There were some funny parts, don't get me wrong. However most of the humor was really awkward, and the fact that they expected me to laugh at colloquial language mixed in with random f-bombs? Um, I'm a little more intelligent than that. Thanks. I see some people laughing at this movie, but I wasn't one of them. Long story short? I regret paying to see this movie. I should've waited until it came on out DVD. Stay away unless you really appreciate sexual humor and random f-bombs as jokes. HOP was a movie that I've actually been waiting to see for a while! I'm a sucker for any animated movie (or partially animated) with cute characters and a fun storyline. It's the truth. True to form this was definitely a cute movie! It was a little less funny than I expected it to be, but I had fun following E.B. and his story. The colors are bright, the story is upbeat and all about following your dreams. Even parents will find something to love in this movie! My favorite part? The reminder that Easter is for everyone, even adults! 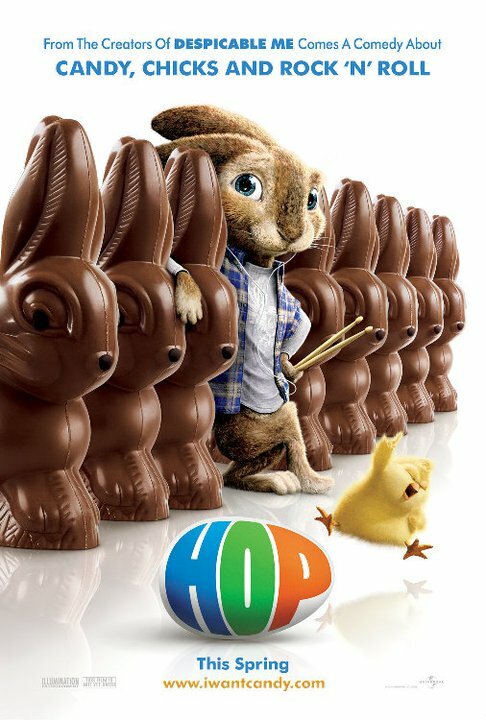 Watch out for chocolate cravings after you watch this movie. I recommend this to parents with kids, and people who would like a chuckle or two.